Tauba Auerbach 24 hr Clock - Limited Edition- Available at Park Life. Available in store on Sept 22. 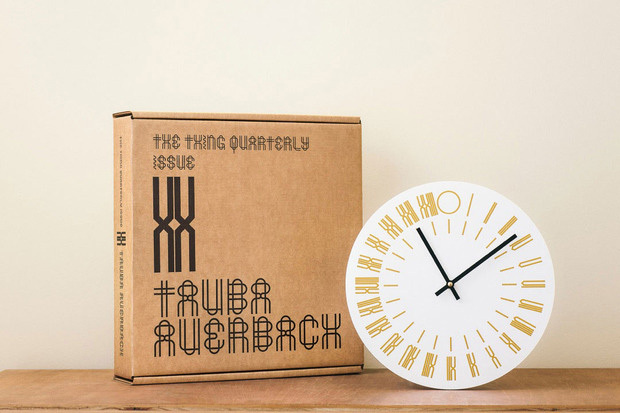 Issue 20, by visual artist Tauba Auerbach, takes the form of a 24-hour wall clock. Auerbach is known for creating work about language and logic through a variety of media. Her training as a traditional sign painter often informs her text-based work. For this issue, the artist designed the clock face and its 24 numerals. The clock’s mechanism runs from midnight to midnight, meaning the hands circle the clock once every 24 hours. This time keeping system, also known as military time or astronomical time, is the most commonly used numerical time notation in the world today, yet very few analog clocks employ a 24-hour mechanism. Made entirely in the United States, the clean design of the clock features black aluminum hour and minute hands and Auerbach’s 24 gold-hued numerals against a clean white face. The clock measures 10.5 inches in diameter, can be hung up with a built-in hook, and is powered by a single AA battery (not included). THE THING and Ms. Auerbach collaborated with New York-based design team Assembly to design and manufacture this issue almost entirely from scratch.